As food allergy moms, this can be a time of intense cooking. If we aren’t hosting a Thanksgiving Dinner, we’re usually helping with one so our food allergy kiddos have safe options. Which is why this is great timing for this post. Please note this post contains affiliate links. I'm sharing with you the products that I use & love. If I don't love it, I won't tell you about it. If you choose to purchase any of the products using the links below, I will get a small commission. Thanks for supporting me and this blog when you decide to purchase. When my oldest was diagnosed with egg and dairy allergies 10 years ago, I honestly didn’t have very many quality cooking tools. Back then, I didn’t see the need. I also hadn’t tried many tools so I didn’t know what I was missing. Until a good friend of mine introduced me to a quality kitchen tool supplier. Which in this case was Pampered Chef, but there are lots of good speciality cooking stores out there. Yes, you do pay more for these tools, but I found it helped to ask for them (or gift cards) for Christmas and birthdays to offset the cost. Once I realized what I was missing and how quality tools saved me time and effort in the kitchen; I was hooked, and I kind of became obsessed. Because of this, my collection has grown a little larger than I probably need. And even though the tools I have are quality tools, not all of them are useful. Which is why I thought I would save you from making the mistakes I made (and hopefully some money) by letting you know my tried and true tools that I recommend every food allergy mom have. 1. At least 2 high-quality knives. My favourites are the large (8”) chef knife and a smaller, (5”) Santoku knife. Both are great to chop lots of things at once. The big knife will slay that large sweet potato or watermelon in no time. The smaller one works well when you want a bit more precise control. If you make homemade bread regularly, then I would also recommend a serrated bread knife. And for all those smaller fruits and veggies, a really good paring knife is worth it! You’ll want to keep those knives sharp by getting a good hand sharpener too. 2. Thick-bottomed pots & pans. Quality pots and pans mean you'll burn things a lot less! I find that you don’t even have to stir custards as much as you do with a lower quality pot. Which makes it easier to cook more than one thing at once. Or, when making those big pots of spaghetti or chilli, I don’t get that layer of burnt stuff at the bottom if I’m not babysitting it as closely. If you can’t get a whole set of good pots, one med. saucepan, a frying pan and a large stock pot are good starting points. These are the ones I love! 3. Garlic press. This thing makes cooking with garlic so much easier. You put the clove into the press and out comes minced garlic. WAY easier (and quicker) than mincing it with a knife. Because I use garlic in almost all my recipes as a base, easy and quick is the way to go! 4. Vegetable & fruit peeler. The key is SHARP and easy to hold. Before getting this one, I had a peeler that was old and dull. Frankly, it wasn’t worth using. It was just easier to peel by knife (which was really awkward). When I got my new peeler, I couldn’t believe how easy it was to peel potatoes, squash, carrots and so much more. It was like slicing butter, and I couldn’t go back now. 6. Food processor. When you need to quickly grate chop or pulverize, a good food processor does the trick. I use this to make safe hummus, add veggie puree to spaghetti sauces and grate veggies or cheese. Make sure to get a size that is big enough. I have a good quality small one which works well, but I usually need to work in batches. 7. Blender. I know many people swear by the high-priced Vitamix or Blentec blenders, but I’ve had my Kitchen Aid Diamond for almost 2 years now and feel like it does an awesome job (at a much lower price than Vitamix or Blentec). So go with what works for your family, but a good blender is great for the food allergy kitchen. From making smoothies to blending GF muffins, and the occasional cocktail for mom, blenders are really useful. 8. Rectangular or square, transparent food storage containers. I used to have a lot of plastic, round containers, and boy was my fridge messy. It’s so much easier to stack and keep square or rectangular containers in the fridge. And little did I know how much better it is when you can actually SEE the food in the container. This cuts down on forgetting about those leftovers for a week in the fridge. What tools do you love in your kitchen? Please share with us in the comments! PS. I’m also working on a post about my favourite BAKING tools which I’ll post a little closer to Christmas, so stay tuned! Food allergy moms cook a lot. So when there are tools that will make this job easier, I'm all for it! 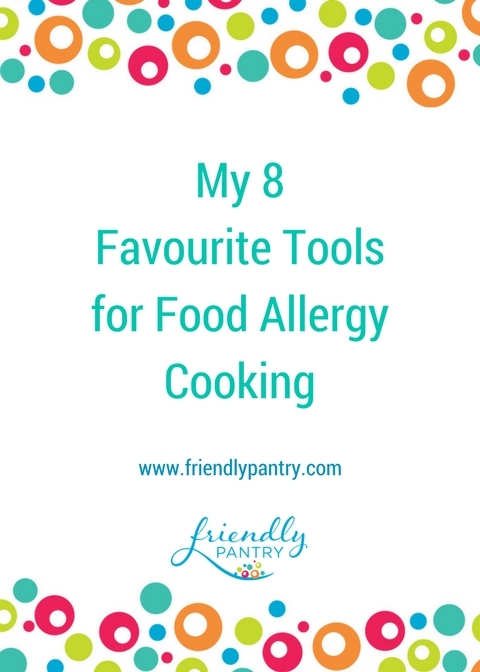 Take a tour of my kitchen to see what tools I love for food allergy cooking.